I was a big *NSYNC fan in my day, and I would be lying if I said I didn't still have an *NSYNC playlist in rotation. But while the band's music is pretty timeless to me, I can't say the same for *NSYNC's fashion choices. I grew up in the era of girl power groups, boy bands, and R&B bands. The first CD I ever owned was II by Boyz II Men, and I even used to dress up as the Spice Girls with my friends when I was a kid. Don't get me started on that Hanson-themed birthday party. My fangirl tendencies ran deep. I didn't just enjoy bands for the music, though. I loved the way they dressed. Some groups like Destiny's Child went the way of coordinating ensembles, while others like the Spice Girls celebrated the distinct personal style of each member. But *NSYNC was something else entirely. When *NSYNC released its first single "I Want You Back" in 1998, my fangirl radar went into overdrive. I loved everything about the group, including the way they all dressed. Looking back now, I see that my fashion vision may have actually been clouded with a deep affection for Justin Timberlake. 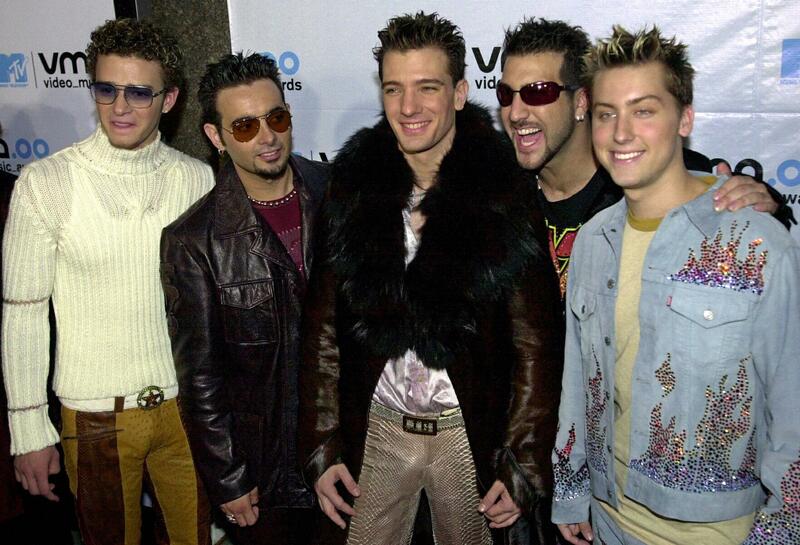 Here are 13 *NSYNC looks I used to love, but simply don't understand now — something you'll probably relate to. I don't know what's worse about the "I Want You Back" video: The odd space graphics or these skin-tight, zip-up turtlenecks that JC and JT wore. I do not want these back in fashion, ever. I remember this rhinestone superman "S" chain being Joey's thing, but looking back at a lot of the band's neckwear is utterly cringe-worthy now. "Raccoon print" may be a stretch, but I don't know how else to describe JC's pants in the "This I Promise You" video. Each member looks like an extra from That '70s Show, but JC's pants and ribbed turtleneck combo is particularly awful. There's a lot happening in *NSYNC's MTV Video Music Awards red carpet outfits circa 2000. From Timberlake's two-tone suede pants to JC's fur collar jacket, it's all a lot of look. But the one that takes the cake for me is Lance's flame rhinestone-encrusted jacket. It's so bad that it's good, and I might actually rock this in size fat today (same for JC's coat TBH). I have absolutely no idea how Chris didn't get the memo about wearing suits without an additional tracksuit underneath, but there you have it. At least everyone else looks polished, I guess. Despite being made in the late '90s, I feel like the "Tearin' Up My Heart" video isn't super dated — with the exception of Joey's khaki overalls. OK, and Chris' button-down and headband combo. But Justin Timberlake in that bed scene is still pretty steamy to me. There have been a number of memes made comparing Justin Timberlake's hair — particularly in the "I Drive Myself Crazy" video — to dry Ramen Noodles. But at the time, JT could do no wrong, and his hair was just another thing I found dreamy. The Ramen Noodle comparison definitely makes me chuckle now. For the record, I never loved Chris' dreads. Looking back, they are even worse than I remembered. I would like to give Chris the benefit of the doubt by assuming that someone on the band's styling team thought it was a good idea. Past or present, dreads on white people are still culturally appropriative. Speaking of cultural appropriation, JT's cornrows arguably also fall into that category. According to Huffington Post, it's a look he says he'd pay pretty good money to get taken off the Internet. There's really nothing good happening from the forehead up for anyone in this photo. These shiny jackets and suits are listed on the premise that I am likely alone in saying I would totally wear one of them today. Give me a shiny pleather onesie and I could totally rock it. In the early 2000s, the soul patch reigned supreme. But now I watch the "Pop" music video and all I can think about is Guy Fieri and pinky rings. Looking at JC in this get-up, I feel like I just got punk'd. Justin and Britney's matching denim suit and dress are truly iconic, and I can never hate on them for creating a look that was so infamous that Katy Perry even tried to recreate it. But the original is always better. While I'm sure JT and much of the world would likely want this erased from the Internet, the look will remain forever in my heart. *NSYNC created some timeless music, and while some of the band's looks may seem dated, late '90s and early '00s fashion is on the rise again. Who knows? We may end up sporting rhinestone Superman chains and zip-up turtlenecks again after all. Want more '90s inspo? Check out the video below, and be sure to subscribe to Bustle's YouTube page for more!